Here are some random "facts" that I thought I would share with you. Today is Pi Day. We celebrate this day on March 14th every year because π (the mathematical symbol used to represent pi) is 3.14159... and so on. If you work in my department you not only celebrate the ratio of a circle's circumference to its diameter (which is what pi represents) but you also celebrate the homonym, pie! This is a perk to working at a college full of interpreters who love to eat pie, and talk about pi. Imagine interpreting a sentence with both pi and pie in it, it can get confusing! 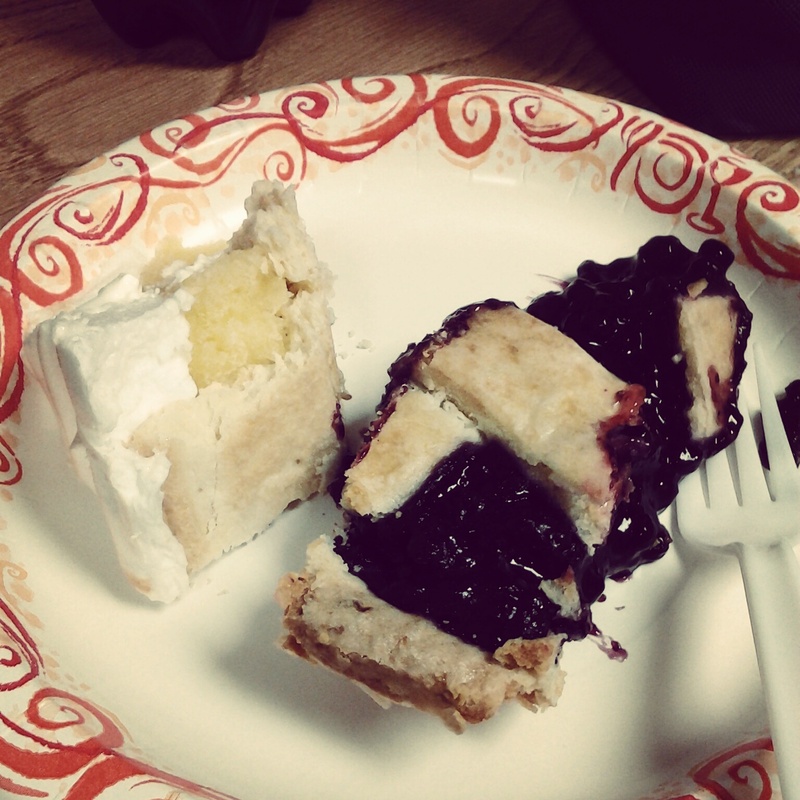 Lemon Meringue and Blueberry, delicious! About four weeks ago, I received a Cathe XTrain DVD in the mail. Mike and I tried it out (unfortunately we can't use the entire DVD yet because we do not have a step or gliding discs) and while it was a little confusing at first, it was fun! The specific DVD that I received was the All Out Low Impact HIIT. The DVD includes a warm-up, round one floor hiit, round two step (haven't tried that yet), round three disc (haven't tried yet) and stretch. It also includes bonus sections with bonus core #1, bonus burn set chest, bonus burn set shoulder and 100 rep challenge scarecrows. Mike and I did the warm-up, round one floor hiit, stretch and then added on the bonus core #1. It was a good work out and I then looked through the DVD options and it includes different preset workouts, one was what Mike and I did just with the stretch and bonus core switched. Mike and I had some old photos hanging in our dining room and we needed to replace them. 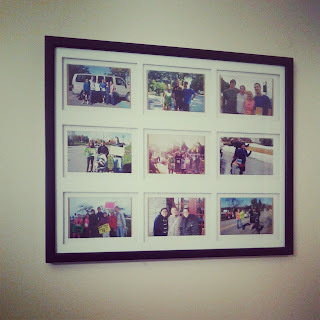 I ordered some photos of us running or being with our running friends, those who are a bigger part of our life than those in the old photos, and I hung them up yesterday! In no particular order: Our RTB Relay Van mates, Us with Isaac, Us with Sarah and Mark before Wineglass, Spectating with Ali and Colin, Us with Crystal after Cape Cod Half, Mike and Crystal, Our Seneca7 Relay team, Me with Rena and Jenny after Skunk Cabbage and helping runners break through the wall with Ali. The only disappointing part is that 7 of 9 photos were able to be printed as true digital prints, which now I know is not 4x6 but 4x5.3. 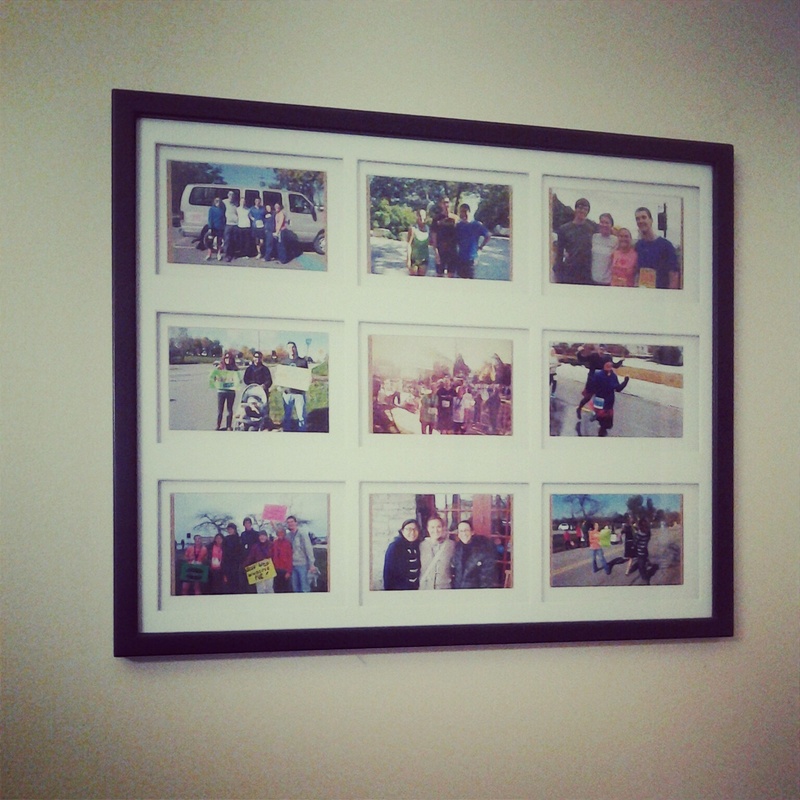 Those photos didn't fit the frame as well, obviously, but other than that it looks good! I just need to find a place for the one vertical photo I picked out of Crystal and I crossing the finish line at her first marathon. Did you celebrate pi/pie day today? How often do you change out old photos with new ones? 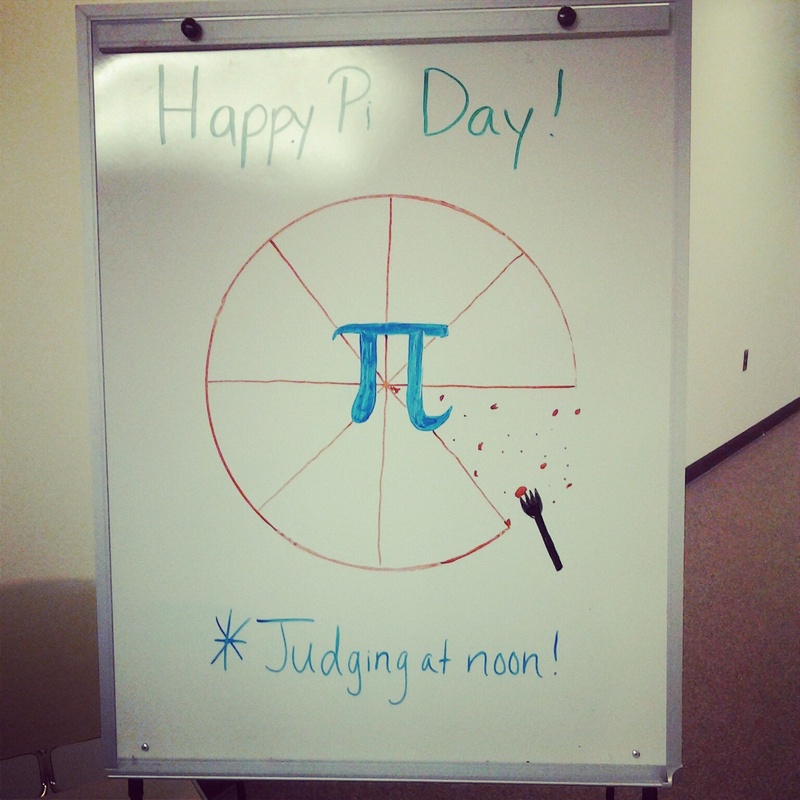 What a great way to celebrate Pi day! Those pies look fantastic!!! Looks like a yummy "pie" feast! The cake is adorable too! looks like lots of fun at work today!! So jealous of your celebration! I was in a high school today, but I was in bio not math and didn't get to share in the goods!! I would really like some pie for Pi Day. 3.14159 pride! I have not eaten any Pi(e) today somehow!! I am resisted the temptation successfully! I barely remembered pi day - and only celebrated by wishing my engineer and geek friends happy pi day on FB. Loser - your way looks better! Just think how fun March 14, 2015 will be when we can take it out two more significant digits (3.1415). I'm awful about swapping out photos. I have a big collage hanging at the bottom of my stairs that has pics from about 4-5 years ago when my husband and I were both still fat and my kids were MUCH younger. Some of the cute kid pics might stay, but I really should make it a goal to swap out the other ones. Though I was surprised you didn't have any leaping pics in your frame. LOL Those are my favorites. 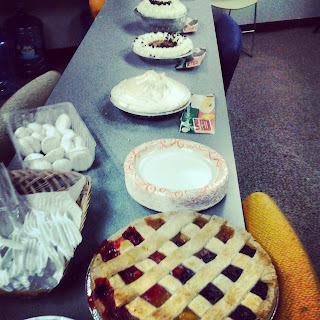 What a fun pi day party! I baked a brownie pie for Thing 1's math class. I understand it was quite a hit. I definitely need to rotate pictures around here. I am terrible at changing photos, I feel like I will hurt the old photo's feelings LOL Actually, we don't have a lot of photos around at the moment because of the renovations but we have big plans for a photo wall when we are all done. That's an awesome display of pies! I used to change photos more frequently, but have settled in with what we have for now. Although with kids, there are constant updates to make! 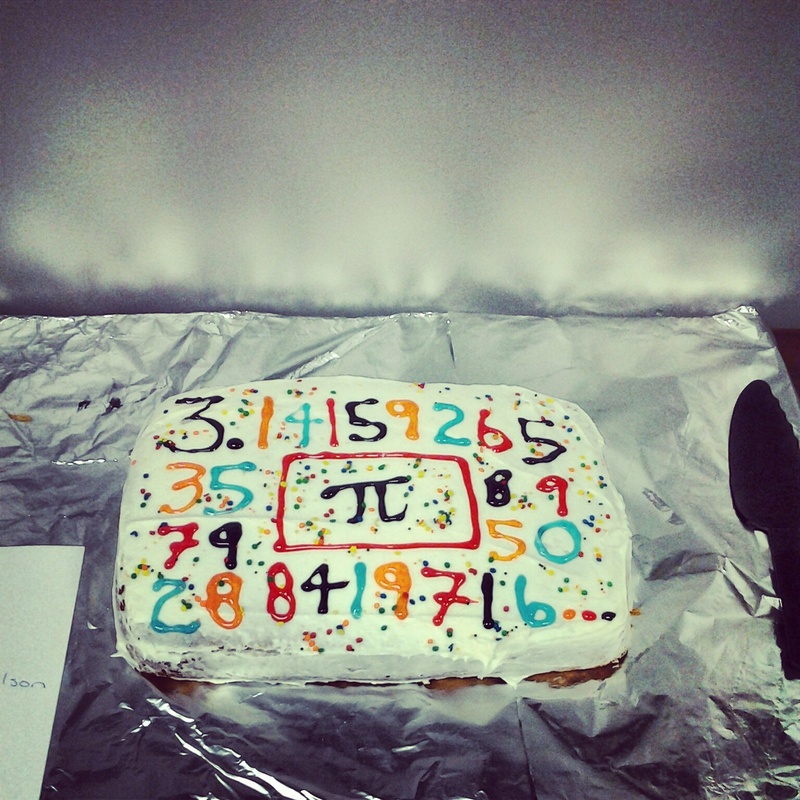 I managed to stay away from all the Pi Day goodies, but boy do yours look awesome! Miss you! Can't wait to see you in a month!